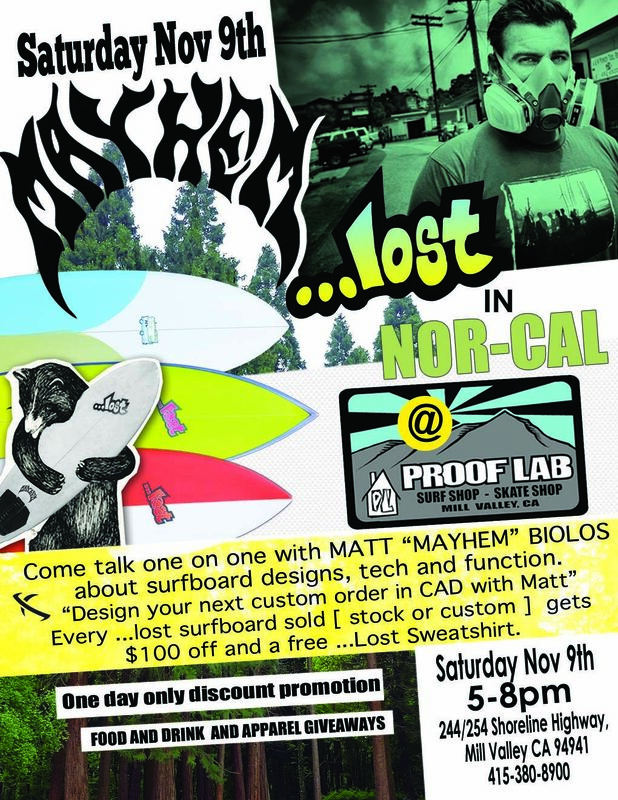 …Lost co-founder and shaper Matt “Mayhem” Biolos will be doing a “Shaper’s Night” 3-stop tour through Northern California November 8th, 9th and 10th. Come talk one on one with Mayhem about surfboard designs, tech and function. Design your next custom order in CAD with Matt. Every …Lost surfboard sold (stock or custom) gets $100 off and a fee …Lost sweatshirt. There will also be food, drinks and more apparel giveaways. First stop is at WISE in San Francisco on Friday. Then Proof Lab in Mill Valley on Saturday. And the final stop at O’neill Surf Shop in Santa Cruz.